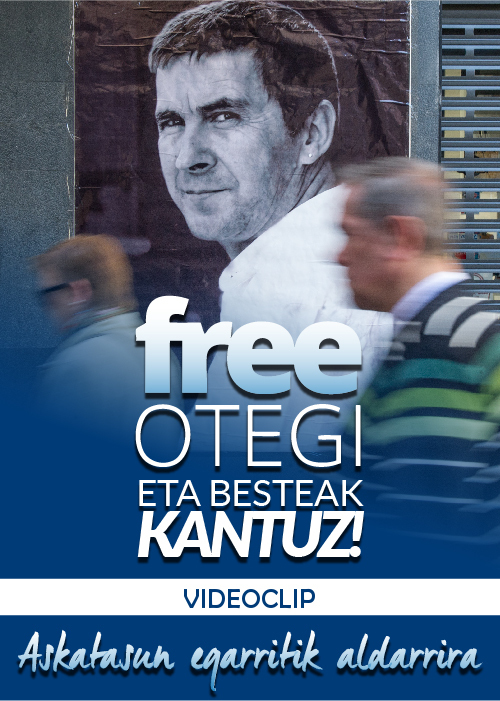 In prison since October 2009, Arnaldo Otegi is considered the most senior political leader in the Basque independence movement, and a key player in its decision to focus solely on political and democratic mechanisms. The change of strategy led to the armed Basque organisation ETA declaring a “definitive cessation” of armed struggle back in October 2011, just a few days after international mediators led by former UN secretary general Kofi Annan formally called on the group to lay down arms. Despite international pressure, the Spanish government has refused to take further steps towards a peaceful settlement of the Basque conflict. Nobel Prize winner Desmond Tutu is the most recent international figure to call for the release of Otegi, who was arrested on charges of trying to reconstitute the political structure of a banned pro-independence political party, Batasuna. The senior political leader remains in prison under strict rules that prevent him from receiving visits from anyone except relatives and close affiliates. Al Jazeera’s only opportunity to communicate with him came via a questionnaire, which reached the jailed leader via channels we are not at liberty to disclose.Al Jazeera: Madrid claims there are no political prisoners in Spain, but you are a political leader, and even a former negotiator with the Spanish government and the international community. Why are you in prison? Arnaldo Otegi: Denying the existence of political prisoners in the Spanish state is part of a strategy designed to deny the very existence of a political conflict in the Basque country. The only reason for our arrest, trial and imprisonment was to undermine the change of strategy among the Basque left independence movement. The state felt comfortable in that confrontational atmosphere because it could tackle the conflict through exclusively “anti-terrorist” means. A strategy based on peace and democracy radically changed the scenario… We dared, and that was our crime. AJ: Basque prisoners and political refugees have recently decided to become an active part of the peace process, accepting a legal approach to winning eventual exoneration. What is the political relevance of this move? Otegi: As political militants, the Basque prisoners are part of the wider left and pro-independence movement in our country, so our decisions are taken within the framework of the strategy change. The adjustment and adaptation of our demands come after an exercise of political pragmatism and revolutionary honesty. However, the state strives to turn the prisoners into a burden for the liberation process. Avoiding that role is part of our political duty. AJ: The Spanish government has remained steadfast in its position towards ETA, despite ETA’s declaration of “definitive cessation of the armed struggle” in 2011. Meanwhile, France seemingly delegates to Spain its policy towards the group. What are the reasons for this? Otegi: I find it extremely generous to label the state’s attitude as “steadfast”. In fact, the position of the Spanish state, in close collaboration with the French one, is that of constant aggression against the new circumstances in our country. Both states need to perpetuate a scenario which offers no solution to some of the consequences of the conflict [prisoners, disarmament…] because they’re both fully aware that once that stage is resolved, the next one will be to turn to our claim, or the unilateral exercise of, our right to self-determination. And that is by far their biggest political nightmare. AJ: How do you assess ETA’s recent move towards disarmament? Otegi: I want to make it very clear: ETA’s decision to disarm will be a logical consequence of its decision to unilaterally abandon armed struggle. Let me make a prediction: When those steps are finally taken, the states will intensify their sabotage and aggression against our people. The key to understand this is clear: The shorter the list of unresolved consequences, the closer we’ll be to the resolution of the political conflict. AJ: There has never been such strong international pressure for the resolution of the Basque conflict. How great is the impact of international support? Can it possibly help to unlock the conflict? Otegi: We’ve maintained a decades-long, fluent relationship with a significant part of the international community. This constant work has brought about their growing involvement with the attempts to solve the Basque conflict. Today, the international community considers us legitimate and trustworthy interlocutors, while they look in astonishment and incredulity at the attitude of the Spanish and French states. I want to publicly express my gratitude for their involvement and encourage them to intensify their work in the forthcoming months. Nevertheless, I also want to stress that the international community won’t be able to solve our problems. It’s us, our people, who have to deal with them. AJ: Do you fear a return to armed struggle if there are no changes in the short- or medium-term? Otegi: The armed struggle will never be present again in the Basque political equation. It is an un-appealable, irrevocable and final decision. AJ: 2014 will witness two referendums for self-determination, in Scotland and Catalonia. Should Basques follow suit? Otegi: That’s exactly the scenario that the states are trying to avoid by stalling the resolution of issues related to consequences of the conflict. That’s very much the key to understanding their level of aggression, hatred and sabotage towards the newly open situation. I truly believe that Basques should follow the path opened by Catalans and Scots towards independence. And if you ask me whether it’s mandatory to address the consequences of the conflict before we can take the new path, my answer is in the negative. Unilateralism will be necessary to achieve independence. We need to start consolidating this process without rushing, but also without pause, with seriousness, intellectual rigour and a lot of passion. AJ: Is there a message you’d like to convey to the Spanish government? Otegi: My message would be the following one: You couldn’t block the change of strategy with our imprisonment; you couldn’t impede our legalisation; you couldn’t and you won’t be able to avoid our electoral rise; you cannot avoid the mass demonstrations for the prisoners; you cannot impede ETA’s disarmament and you won’t be able to hamper how, sooner rather than later, we’ll exercise our right to self-determination and become a new state in Europe. You can extend our imprisonment… but you won’t be able to prevent our people from achieving their freedom because the former is in your hands, but the latter is only in ours.